Easy to operate, with clearly labelled button controls. Build quality feels reasonably solid too! As the microwave is a 20 litre model, the turntable is relatively small (25.5cm) so best check the measurements prior to buying. 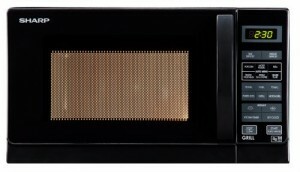 Looking for a small and cheap grill microwave? The Sharp R662KM provides a powerful grill together with an 800w microwave and 20 litre volume, and is priced at the lower end of the microwave market. The exterior is finished in a black and grey colour scheme, which shouldn't date too much and is fairly neutral in style. In terms of specification, the R662KM offers a 1000w grill, together with the aforementioned 800w microwave, split into 11 different power levels. The control system is a touch panel based, with each individual button very well labelled for easy operation. The viewing window for the microwave is relatively small, yet the interior light is more than adequate to see how well the food is cooking. The handle feels firm to the touch, and we can't foresee any issues with reliability, as well including a standard child lock facility to avoid accidents. The LED display is refreshingly bright and very legible, even in bright kitchens. 8 auto cook functions and included, which should prove to be a time saver for cooking popular food types. In operation, the R662KM drew praise from our testers. It performs very well, especially considering the low overall price tag. Food was heated and cooked fast, with no noticeable uncooked or cold spots. The grill takes a little time to heat up, as with most grill microwave ovens, but once it reached temperature it crisped and browned food nicely. Overall build quality is pretty decent, and the microwave as a whole feels solid to the touch. Granted, it might not as stylish or flash as higher end grill microwaves, but purely from a performance basis, we couldn't fault the Sharp R662KM - it works well, and offers excellent value. If you're looking for a modest sized budget grill microwave, which will offer dependable performance, then the Sharp R662KM will tick your boxes. It works well, is solid to the touch and offers good value. Recommended! Timer input max 99 minutes and 50 secs.